Grasshopper Magic by Lynne Jonell. A Magical Mix-Ups Book. Review: Derek looked at him sideways. 'Your not scared are you?' Abner scowled. Of course he wasn't scared. 'We'll come with you part of the way,' Tate said." Abner is the main character of Lynne Jonell's magical story titled Grasshopper Magic. Abner is intelligent and he does what he must to help someone in need. This book was written by the creative author Lynne Jonell and artistic illustrator Brandon Dorman. 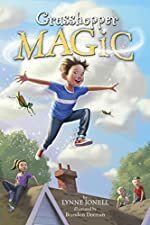 There are two more books in this charming series, which includes, Hamster Magic and Lawn Mower Magic. Grasshopper Magic is the third book in the series. Abner, the second oldest child in his large family is not courageous at all. He must dress up like an old famous relative to celebrate for a town festival. But, he doesn't like big crowds and he hates speaking in front of thousands of people. He has to look strong and invincible while riding a stunning horse through Main Street. Abner has never done anything heroic before in his life. His three supportive siblings try to help him become brave before the festival arrives. Some time ago, a deep underground magic has done many bizarre things in the four children's lives. They must face this powerful magic, grownups, annoying babies, and more to accomplish Abner's problem. Abner must, somehow become the person he wants to be. But what problem will he need to face in order to be brave? I thoroughly enjoyed Grasshopper Magic! The setting makes the story very interesting and enhances the action parts. I would love to be friends with Abner because we are quite alike. Abner is almost the same age as me and he is very smart. Abner is very unique. Lynne Jonell's writing style has made this book very suspenseful, like when he wrote "'No,' said Abner. 'I don't want to do it." What doesn't he want to do? Read the book to find out! Grasshopper Magic is a great book for younger boys or girls between ages 7-9. Although it begins very slowly, it doesn't take long for it to get cheerful and suspenseful. Grasshopper Magic is told in 1st person and that makes the story not confusing, but exciting. This story showed me that no matter who or what you are, you are brave and you can do anything if you try your hardest. Be who you can be! We would like to thank Random House for providing a copy of Grasshopper Magic for this review. Have you read Grasshopper Magic? How would you rate it?